Above, SonoBat creator Dr. Joe Szewczak releases a light-tagged Indiana bat for tracking and recording. Fine scale analysis, Meticulous and robust data extraction. 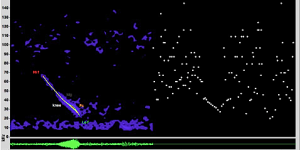 Call data parameterization from intelligent trending of high resolution full-spectrum sonograms that extract full trends and detect nuances even in low amplitude or noisy conditions inaccessible to power trending methods such as zero-crossing. Extensive and broadly representative full-spectrum library. 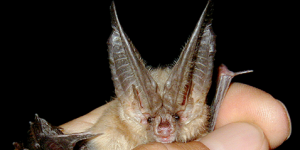 Species classifiers based on the most robust, species-confirmed full-spectrum reference library from more than two decades of continent-wide careful tracking, recording, and interpreting bats in the field. Classification engine that integrates vetting experience. 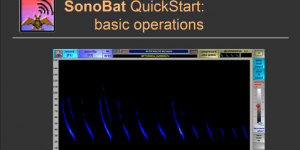 SonoBat species classification integrates quantitative machine learning with algorithms that incorporate more than two decades of expert acoustic classification experience to produce results that surpass machine learning alone. SonoBat knows when to say no. SonoBat automatically recognizes and rejects the many conditions and circumstances that could otherwise result in errant classifications. SonoBat brings automated processing of recorded files and automated species classification– indispensable tools for long-term and large-scale survey and monitoring projects. For data integrity and optimal classification performance, SonoBat performs a number of intelligent signal quality assessments and data extraction routines to provide the most faithful and confident call data. Robust high resolution data extraction to capture subtle call features. Expert System classifiers integrate machine methods with human experience. Customizable tools for project vetting, analysis, and export.